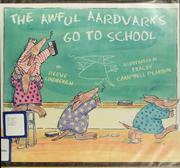 Some mischievous aardvarks visit school and create chaos in the class. The other animals in the class do not like the aardvarks' behavior and the aardvarks are expelled. Lindberg, Reeve, “The awful aardvarks go to school,” Children's Picture Book Database at Miami University, accessed April 20, 2019, https://dlp.lib.miamioh.edu/picturebook/items/show/6392.